New inventions have made strainful works always easier for people. Let us take an example of a washing machine. In early days, people used to wash their own clothes by hand and scrub all the dirt away using a brush and detergent. Later, the washing machine was invented, which simplified laundry cleaning. The device was further developed to produce semi-cleaners and lately fully automatic washing machines. A new concept has been introduced by a a designer named Elie Ahovi, which works under the principle of magnetic levitation. The device, named as “Laundry Orb” consists of a spherical drum that cleans clothes by scrubbing them using dry ice, instead f water. The spherical drum is basically a ring filled with batteries. These batteries produces magnetic levitation inside the ring. 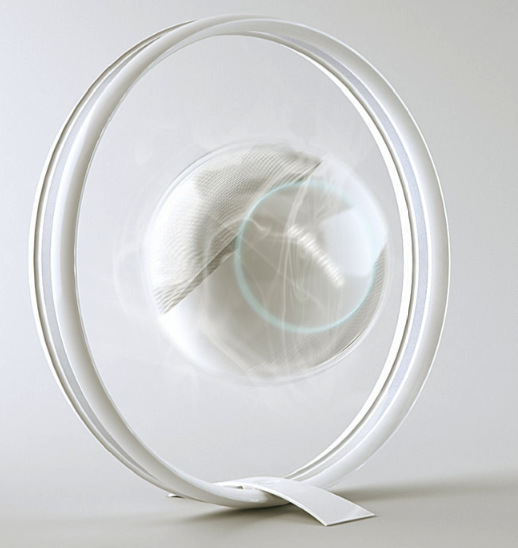 To levitate, a super-conductive metal laundry basket is introduced inside. A low temperature is required inside the ring. This is produced by using liquid nitrogen. A double layered shatterproof glass is also introduced inside. Thus, the whole drum levitates as soon as a magnetic field is produced. The whole process is controlled usingÂ a touch screen interface. The dry ice is introduced inside the ring at supersonic speeds. As soon as it hits the dirty clothes, the carbon dioxide interacts with the dirt and separates them from the clothes. The dirt is then collected and filtered out through small pores. The carbon dioxide is then removed and re-frozen. Thus, the clothes are cleaned and dry. The cleaning process will take only a few minutes. Since no water and soap is used, the clothes are prone to look new without any wear ad tear. The environment can also be protected to a certain extent by saving soap. Besides, we can use the surplus carbon dioxide for something useful. Though the whole concept sounds interesting, there are certain cons. The removing of carbon dioxide and refreezing it requires a lot of energy. It’s good that its a waterless washing machine but without water is it clean of dirt on the clothes and cleans properly,i don’t think so. Its interesting post that by using this washing machine it saves water in future and i like this technology. its future generation washing machine and the technology is awesome. Water less washing machine is the best and perfect example for the future genreation which make the life more easier. It is a wonderful subject. Now need for our future world. It is true that without soap & water a washing machines can clean clothes?.pl. illustrate clearly. Amazing and quit interesting.Let’s wait for to make energy efficient and lowering its price to become in the reach of common people. Thanks a lot for sharing this information.